After Maddie was born, I desperately searched the internet for people who were in our situation, people that would be able to give Mike and me a glimmer of hope. I entered in all the search words, never expecting that I would stumble across the perfect blog by accident. Maya’s twins were born two days after Maddie, ten weeks premature. We started commenting on each other’s blogs, then emailing, talking on the phone, you get the idea. When Maddie was hospitalized when she was four months old, Maya sent an amazing care package. We had so much in common besides our daughters, too: we’re the same age, have the same interests, and she was from my home away from home. Maya and her husband came out to visit Mike, Madeline, and me in Los Angeles at the beginning of 2009. We made plans for the three of us to visit Maya’s family later in the year. We wanted the girls to meet, our three miracles. Unfortunately, that never happened. I am so thankful that Maya and her husband got to meet Maddie. A few months ago Maya told me that she and her husband had decided to move to Israel. I knew I had to go out to see her before they left. I found an amazingly cheap flight (you know, a red eye next to a drunk a-hole), and I packed Annabel up for a quick whirlwind trip. Meeting her daughters has been amazing for me. Wonderful, but so hard. It is the closest glimpse at what Maddie would be like. Her girls talk in full sentences, have distinct personalities, and love their mommy and daddy so much. Looking at them, I now feel like I can close my eyes and imagine what Madeline would be like. I’m so sad they are leaving the US, the time zones will require some creativity with communication. I know we’re up to the challenge. Distance makes no difference with true friends. “Distance makes no difference with true friends” – so very true. I’m so glad you and Annie got to see them before they leave. Hugs to you. What a beautiful picture! So glad you got to see them before they leave! I typed in my blog address wrong (silly touch screens). Had to comment again, I didn’t want you thinking I was some weirdo with your kiddo’s birth announcement…wait, DOES that make me weird?! .-= Sara K.´s last blog ..What I’ve been up to and my new blog =-. I am so glad you were able to visit and see Maddie’s soul sisters in action. My son was born the same week as one of my friend’s children. Her duaughter passed away almost two years ago. I know iti is bittersweet but she also loves to see him and is always amazed by his size and progress. We love their daughter as your friend loves Maddie – without end. Best wishes to your friend and her family on a huge move! .-= Jenny´s last blog ..Mama Moments =-. I live in Germany and all my family and friends are in the US. My husband (he’s German) is even over there right now. Sometimes you feel the distance, but you are right, it doesn’t change things between loved ones. It’s great that you all got to get together before she moves. Safe travels and best wishes to her. It has become a small world. We talk to people on the other side of the globe like with a neighbour. .-= Catherine Lucas´s last blog ..Laundry day in Yorkshire and jam… =-. Worlds collide! That’s such a beautiful photo, two beauties together. I found your blog way back, through Maya … putting pics of Maddie on her blog all the time. I HAD to come over, to see who is this girl that GG is clearly besotted with. Who is this wee sprite with the magical eyes? And it was you Spohrs, all with your LA coolness. You and GG will always be Soul Sisters. And so will her twins and Madeline. .-= edenland´s last blog ..Ultraviolet =-. So happy that you were able to visit Maya before she left. Glad the trip was good. True friends are definitley hard to come by and I’m so happy that you have so many!! .-= AmazingGreis´s last blog ..Sometimes random is good… =-. So great that you were able to visit your friend! Love the photo Annabel has the BEST rolls!!! A friend is a precious thing, indeed. Luckily, the internet is a wonderful way to stay in touch, despite the time difference. .-= Lynn from For Love or Funny´s last blog ..Cleaning unearths clues that I’m insane, so I don’t clean anymore. =-. everything will work out with your friend. .-= tanya´s last blog ..Here I am.. =-. Look at that sweet little chunky monkey! She is just a pile of cute on cute with some cute on top! It is super awesome that you got to see your friend (minus the drunk dude sleeping on you part of course), and bittersweet to see her babies who were just destined to be some of Maddie’s bffs. Oh and you are right, time zones and distance don’t keep friends apart! .-= charlane´s last blog ..Couch Cake =-. So happy you & Maya got to get together but I’m so sorry Maddie wasn’t there. I’m glad Maya’s girl it…..I just really wish your did too. Life can be so unfair and for that, I am so very sorry! What a fabulous photo of those two beautiful girls!! Maya sounds like a wonderful friend! There’s not too big of a difference between NY and Israel is there? Glad you got to catch that red eye, I’m sure that there’s a significant difference in the cost of a flight! .-= Kelly´s last blog ..Top 15 Percent! =-. Oh this is chilling, and inspiring. .-= Adventures In Babywearing´s last blog ..Your face grew up =-. Distance does make the friendship even stronger! You will remain close! .-= Java´s last blog ..My tears… =-. A gorgeous photo – isn’t it miraculous how the internet brings people together? .-= Megan (Best of Fates)´s last blog ..Bacon & Other Loose Ends =-. I got Annie’s birth announcement, thanks a lot! SKYPE! It’s the best thing, it will feel like you’ve never left each other!! It is so nice to have someone there for you, who understands you like no one else! Gorgeous picture of Miss Annie! I love me some Maya! Walking for Maddie at the march of dimes with Maya last year was an incredible experience. 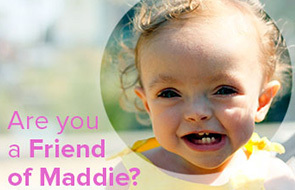 We kept getting chills when we talked about Maddie. I look forward to Soleil and Neve becoming friends with Annie, despite the time difference. .-= Molly´s last blog ..My cousin =-. Annie looks so happy! Btw, her birth announcement is beautiful, thanks!! .-= jen´s last blog ..ice cream =-. I am sorry your friends are leaving. You are fortunate to have them in your lives. BTW, Annie is chubby delicious!! .-= Candice´s last blog ..Not Me! Monday =-. That is so awesome that you were able to make the trip out to see her and meet her girls. I love Maya. I’ve always loved reading her blog since her girls are just a few days younger than Maya, and of course my daughter shares her fabulous name!!! You are right too, distance won’t make a difference. .-= Lisa´s last blog ..Teaching Children About Money =-. This post brought tears to my eyes. I’m so glad you got out there. Maya seems like an amazing friend. You girls are very lucky. Annie is killing me with the baby fat. I just love her face. .-= mel´s last blog .. WORDLESS WEDNESDAYSort of.This picture is a few weeks old…. =-. Aw. What a sweet picture. Glad you got to see your friend before she moved. Hugs all around. .-= Diane´s last blog ..Here is what I have added to etsy =-. So precious. I can relate to the connection you feel with your friend’s girls who are Maddie’s age. I feel the same way with my friends’ little girls who are Emma’s age. It is bittersweet. You will find the best way to stay connected with your sweet friend, I have no doubt. This is a beautiful picture of amazing friends! What a great picture. People who say the internet cuts people off from “real life” need to hear stories like this! .-= J+1´s last blog ..Sunshiny =-. I am so glad that you have such a wonderful support system around you. Maya seems like a wonderful friend. What a sweet tribute to your dear life friends. You’re very right — time zones are not boundaries for true friends. .-= Just Jiff´s last blog ..4 down, 1.5 to go… =-. I’m glad you got to see your friend before you left. It must have been bittersweet to meet her daughters but fun (and hard) to imagine what Maddie would have been like. I love that last statement about true friends. Skype is a wonderful thing!! Most of our family and all of our best friends are in Turkey and we manage to stay close and watch each others children grow up. It’s not the same as being in person but it’s pretty darn close. I also received Annie’s birth announcement yesterday…beautiful!!!! Welcome to the world Miss Annie, it’s been long awaiting your arrival! I can only imagine how bittersweet it was to see your friends children. No words for that only a cyber hug from one momma to another to let you know you and Maddie are thought of so often. How great that you got to meet her girls and that Annie met them too! Thank goodness for technology – it might be harder to stay in touch, but it’s possible! .-= Lisa´s last blog ..From The Super Food List: Salmon =-. Skype is a great way to keep in touch with people! It’s been so nice for my daughter to see her grandparents that way. You are so blessed to have amazing friends and I’m so glad Maya and you found each other. Annie’s birth announcement was so cute!! Got it yesterday. She is a doll and looks so happy! So glad you had some time with your friend!! .-= Kellee´s last blog ..Sunday Share – Sads Be Gone =-. My BF lives 250 miles away (not far in American terms, but still far enough), we both work and have husbands and children. We rarely seem to meet up any more but she is still there for me and I for her. There’s FB, text and email. There’s still occasional holidays, so much cheaper when there’s some where to stay over there. You wont lose a best friend, it just becomes more concentrated and tastes all the sweeter for it! That’s awesome. I’m sure the friendship will continue to grow and you can visit. Love that picture of Annabel. OMG Annie is growing so fast!! Look at those cute rolls! She needs a little baby bra!! Love it! I am so happy that you got to see your friend before they left! I agree no distance will get in the way of a true friendship. I agree with some previous posters, use SKYPE! We use it to talk to the in laws who live far away and LOVE it! .-= Nicole´s last blog ..Saturday =-. Im so glad you got to see them before they left. You are right when you say distance doesn’t matter between true friends. I met my 2 best friends thru a preemie support group, one lives in Los Angeles and one closer to me in Houston. I don’t get to see them as often as I like, but we talk as often as we can. LOVE LOVE LOVE the baby boobies!!! That is the great thing about technology, you can skype and talk and still see eachother. I am sure sometimes you will be up late at night/early in morning with Annabel so it will work out to Skype then. I got my announcement in the mail yesturday. Beyond beautiful, after my husband asked who she was, and I explained, he even commented on how adorable she is. I love that she is smiling so much now, she is going to be a smiley happy baby like her big sister, I can tell already! Holy frijole! Annabel has the most awesome baby chub I have ever seen. Maya and I got connected when I was put on bed rest during my twin preganncy. She was such an encouragement to me with her emails as I laid in that bed hoping and praying for another day. I see through your story that she was, and is, that encouragement to you too. I’m so glad you had the opportunity to go out and have some time with her before she leaves. .-= Nanette´s last blog ..Lovely long weekend =-. What a wonderful post … I enjoyed the link back to your time in NYC and love the details of your friendship (not to mention the delectable Annie picture to conclude). It is relatively easy to stay in touch these days … when my two best friends from college each went off to do years in Costa Rica and Turkey after Graduation, I talked to them just as much as I did college friend who stayed in the US! Looks like you and Maya will ALWAYS be friends (and you’re BOTH so lucky for it). What a great photo. And I love Maya. She’s amazing. I’m sorry to see her leave… but thank god for the internet. .-= Undomestic Diva´s last blog ..The sober alcoholic =-. Awww, that’s so beautiful. So sad that they’re leaving, but so beautiful that you meet and now have a great friendship. And who knows…maybe one day you’ll make the trip out to Isreal to see them. That would be a cool adventure. =o) When Annie’s a bit older of course. oh i loved this post – i clicked over to GG site as i’d never been there before…and i could hardly stop reading..
although i didn’t get too far – now i’m sitting here (at work – as though i have nothing else to do…UGH) with tears streaming down my face..the post she wrote ‘that day’ – last month..omgoodness…it was powerful. oh what a GREAT friend you have…i’m so happy for you both to such a wonderful bond and friendship – one that will last forever…no matter how many miles apart you are. also…i got my annie announcement yesterday too…exciting!! thank you! Oh, that is such a sweet picture of Maya and Annie. I would enlarge that and frame it. I hope she and her family are safe in Israel. Lots of unrest everywhere, so scary to travel – but I am glad you were able to get to see her, and sorry about that dopey drunk guy. Very strange. Hope you had a much better flight back home. As a military family we’ve experienced a lot of loss and sadness as friends moved away, but technology is an amazing thing. Between Facebook, email, blogs, etc. it’s so much easier to keep in touch. I have great friends as far away as Guam, Hawaii, and Germany but it’s great to be able to share anything with them at the touch of a button. No, it’s not the same as seeing each other all the time, but long distance friendships are a wonderful gift full of unexpected surprises. .-= Noelle´s last blog ..Splish Splash–Dance Recital 2010 =-. I’m not sure you ever knew this…but after the service she was in the front of my rental car and she said that she broke passover and had a bite of cake at the reception. She’s a good kid that Maya, I’m so glad you found each other. .-= moosh in indy.´s last blog ..the next generation. =-. .-= Melissa (Mbonn)´s last blog ..Sunday Snippets =-. Annie has some serious chubs on her sweet little legs! How adorable!!! .-= Rebecca´s last blog ..Six Years =-. What a sweet story of true friendship! So glad you were able to see them before they leave & visit with Maddie’s little firends. I know that while the time difference may make it a little more difficult to talk regularly, that because of modern technology, it’s not impossible! Love, love. love Miss Anabel! How sweet. Annie looks adorable and so happy! Maybe you can make a trip to Israel some day! I have to tell you- THANK YOU so much for making a post a few months ago about what to say to parents who have lost a child. A co-worker lost her daughter on Mother’s Day; she would have been 2 on May 20th. Your words really helped me to find the right thing to say to her parents. You are so inspirational. Thank you again! It’s true. My best friend in the entire world and I have not lived in the same city since about 2000. She and her family now live in Guam. We have managed the time difference; we met in Hawaii, which was a half way trip for each of us, for a fun, girls only vacation AND she and her family just left my house. She’s here until mid-July. Each time we see each other, it seems that no time at all has passed! You and your friend will make things happen so you stay in touch and get to visit each other – maybe even in fun, “half way” places! .-= Jo´s last blog ..I gave it my below average. And I’m proud of it. =-. .-= Geminigirl´s last blog ..I Scare Semi- Celebrities =-. Love the photo, also I got Annie’s announcement today…it is so sweet! Thanks for allowing us to share in the joy that she is! .-= Haley´s last blog ..And now for something a lot less depressing =-. LOVE that picture of annie…what a cutie pa-tootie! oh, and skype is an awesome way to keep in touch (for free…woo hoo!) with friends and family far away. we live in germany, but still get to see our family whenever we want on skype. So glad you were able to meet up – love the pic! .-= amanda´s last blog ..busy bee =-. I love Maya’s blog! I also have twin girls (3 years old) & infertility issues so I instantly connected with her blog! I teared up when I saw her negative pregnancy test post, since I am all to familiar with that feeling. And bawled when I read her blog about Maddie. You two seem like the perfect match for best friends Thank you for sharing, I now have another blog to read! .-= Lisa V´s last blog ..San Fran action! =-. OMG her thighs are fantastic! The pic of Annabel and your friend is so fantastic. Annabel reminds me of the smiling, happy Buddha. So much joy radiating from such a little body, but oh such a large heart and soul. Thank you for sharing her with us. .-= Jeanne´s last blog ..Stream of Anger, of Consciousness, of Freedom =-. Awww. Such a sweet photo. So glad we have the internet to help us find true friends. .-= Dawn´s last blog ..Hey! Hey! Whadda Say! ~It’s My SITS Day! =-.